Space shuttle Atlantis and its crew of seven astronauts launched on spectacular plumes of gold-tipped smoke today carrying Europe’s primary contribution to the International Space Station – the Columbus science laboratory. The lab is filled with racks for experiments and research euipment and has fixtures on its exterior to also host research exposed to the vacuum of space. It represents the latest international addition to a facility already made of structures from the United States, Russia and Canada. “It shows that there is a real partnership between communities,” NASA Administrator Mike Griffin said. The launch was crucial for the European Space Agency because the Columbus lab represents a cutting edge research facility for Europe and the continent’s first manned spacecraft. 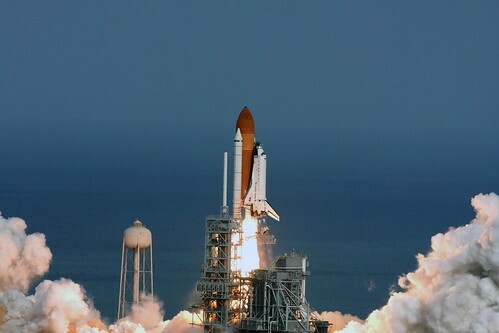 The launch came seven years to the day after Atlantis carried NASA’s science laboratory named Destiny to the space station. “It’s great to have two laboratories in space,” said Bill Gerstenmaier, NASA’s associate administrator for space operations. Atlantis’ liftoff came despite concerns that a weather front would interfere. But those concerns did not materialize and the launch team sent Atlantis aloft at the appointed time. “We did set ourselves up to be ready, to be prepared,” said Leroy Cain, chairman of the Mission Management Team. The crew of Atlantis will now check out its systems and inspect the heat shield while chasing down the space station. It is to dock with the station Saturday. There will be three spacewalks during the flight so astronauts can attach the Columbus lab and connect its power and fluid lines. The flight is to last 11 days and end with Atlantis returning to Kennedy Space Center. This entry was posted on Thursday, February 7th, 2008 at 2:15 pm	and is filed under Around the Blogs. You can follow any responses to this entry through the RSS 2.0 feed. You can leave a response, or trackback from your own site.